Happy 30th Birthday Mario Brothers! Two Italian plumbers became megastars by stomping on turtles, punching bricks, and throwing fire at mushroom people. The Mario Brothers, Mario and Luigi, remain cultural icons. You can’t go to a Halloween party without seeing them on someone’s costume, and the devoted fans have the brothers permanently inked on their skin. Now those salutes have a good reason. In 1985, the Super Mario Brothers video game made its debut in homes around the world courtesy of Nintendo. That’s 30 years ago; happy birthday Mario and Luigi! 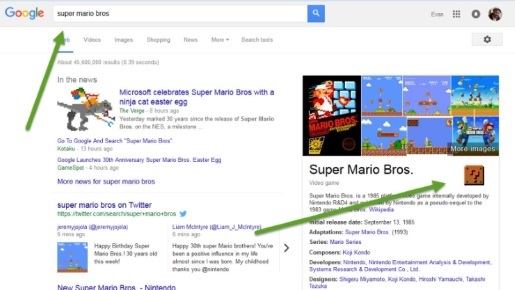 Google celebrated the 30th birthday of the Super Mario Brothers video game with a special Easter egg. Go to Google and enter Super Mario Bros. What pops up on the right is a little informational listing. As you can see, there’s a little question box the kind that keep pretty much every secret safe in the Mushroom Kingdom. Click on it with your festive Mario nails. Not just once, though. When you click on the question box 100 times, you’ll hear the familiar 1-UP sound effect from the classic Nintendo Entertainment System video game! It’s not a great Easter egg, but it is a nice surprise. I’d guess that a playable Google level would be too much, but maybe I can dust off one of my old consoles and get some Mario action going in honor of my favorite video game heroes.